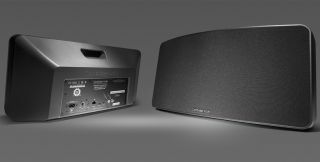 Cambridge Audio adds Spotify Connect to Air 100 and 200 wireless speakers | What Hi-Fi? Already solid wireless options, the 2nd-gen Cambridge Audio Air speakers now sport Spotify Connect and claim sonic improvements. The Air 100 and Air 200 have been around for a couple of years, offering Airplay and Bluetooth wireless streaming, but now they've been upgraded, with the addition of Spotify Connect and claimed improvements to the sound quality. Having Spotify Connect inside the speaker means you don't need to use your phone or tablet to stream from Spotify. Instead the speaker does the streaming work and your device simply acts as a remote using the Spotify Connect app. As well as sparing your mobile device's battery and freeing up your phone for calls, Connect uses a higher-quality wi-fi connection, so should deliver a more robust connection and potentially better sound. Elsewhere, it's as you were with the 2nd-gen Air products, which both include internet radio, an aux input, bass control and both app and remote control options. The Air 100 V2 delivers 100W of power, while the larger Air 200 V2 delivers - you guessed it - 200W, from two slightly larger drivers. You can read our original reviews of the 1st-gen Air 100 and 1st-gen Air 200 online now.